A couple of weeks ago, I wrote about the idea that someone should remake The Big Short, but from the perspective of MLM/pyramid scheme fraud. My idea wasn’t very unique. Soon after publishing the article, I realized that there was indeed a movie already out there based on Bill Ackman’s billion dollar short of the MLM, Herbalife. The movie, Betting on Zero, has been in limited screenings at just a couple of film festivals as the producers work on full distribution. That’s one of the reasons why you probably haven’t heard of it. Last Thursday Betting on Zero came to my neck of the woods (population 60,000) on it’s 4th stop. I can’t even begin to the calculate the long odds that one of the biggest movies exploring MLMs would be coming to me, one of MLMs biggest critics. We packed up the family for the long 10-minute drive. I had no idea that I’d be in for much more than a movie, but actually meeting Bill Ackman. First there was the movie to watch. But even before that, there was controversy about the movie even existing. Some people might find the background behind the movie just as interesting as the movie itself. John Fichthorn, Dialectic Capital co-founder has been following MLM since around 2004, where he claims it was sleazy and harming people. He explains that the industry has co-opted its critics, the internet, the legal system, the government, and “obviously Wall Street”, and the Federal Trade Commission. This became a “bee in [Fichthorn’s] bonnet” and he approached filmmaker Ted Braun to tell how consumers are getting harmed in a credible way. He financed the movie anonymously because the industry is so litigious. It’s easy to understand why someone might want to hide when they are exposing a $150 billion dollar industry that co-opts all the groups he mentioned. Fichthorn challenged Ted Braun to make a movie that’s positive about the MLM industry and/or positive Herbalife. Given the hindsight of the FTC’s findings, some wonder how Herbalife can even be in business. I didn’t realize that cybersquatting on domain names was legal nowadays. Even if it wasn’t, that simply validates Fichthorn’s opinion of MLM’s sleazy nature. Fichthorn came out to show that he had no position in Herbalife’s stock and that he was only interested in the altruistic idea of telling the story to help consumers. He also explained that Herbalife and their supporters were invited to share their side of the story in the movie, but they declined. I’m going to start by giving my wife’s opinion on the movie. Why? She represents what I’d call the average person who knows a little about MLM, but hasn’t spent nearly ten years of her life studying it as I have. Also, my other option was to ask my 2 and 3 year olds… and they would tell you it was an adult movie, not a kid movie. My wife said it was fantastic! So I’m left to presume that highly-educated people that like documentaries would think the same. And just maybe the average public would too, if they weren’t focused on what nonsense Kim Kardashian is up to. It’s hard for me not to be a little more critical of the film. I appreciate that Ted Braun had to take the journey down the rabbit hole to discover the truth about MLM. I’ve taken that journey with hundreds or thousands of commenters on this website, and it’s getting a little old. I want to show them the destination, because people are generally too busy to take the journey. A large chunk of the movie was about the Wall Street aspect of Herbalife specifically. That’s fair… hey it’s what the movie was supposed to be about. However, it’s easy to get so involved with stock prices that you lose sight of the MLM aspect. I’ve read from many sources that there are around 1200 private MLMs. The Wall Street story is great on its own, but it is an intermezzo compared to the main MLM story. Maybe for others the Wall Street hook will be what draws them into learning more about MLM fraud. I want to praise Ted Braun for showing Herbalife’s defense with videos of the CEO even when Herbalife didn’t appear to want to defend itself. Given the FTC’s evisceration of Herbalife, it feels to me that they had no defense other than bemoan after the fact that it was one-sided. In any case, readers should refer to my wife’s review rather than my own unfair expectations that suit what I want to see. For example, I was able to say to my wife: Robert FitzPatrick is the guy you took a message from while I was walking the dog after I wrote Pyramid Scheme Questions Cause Herbalife to Lose 3 Billion Dollars. I would call back Mr. FitzPatrick a few minutes later and talk with him for around 2 hours. Lawyer Douglas Brooks had a fairly significant role in the film as well. And he has been very helpful to me. While the LifeVantage/Protandim (LFVN) settlement wasn’t the result I was looking for, he provided support at a critical time of need (and the result wasn’t his fault in any way). @prof_billkeep @TruthinAd "It's next to impossible, like herding cats" – MonaVie's Dallin Larsen: https://t.co/ueoTJNwJV2 Wait, responsible? After the movie was the best part of the event for me. 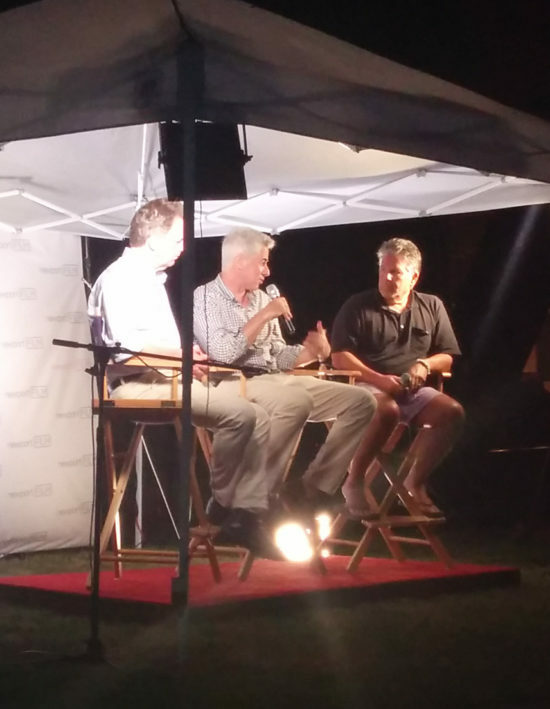 Filmmaker Ted Braun and Vanity Fair’s William D. Cohan participated in a panel discussion with… Bill Ackman. The panel was excellent… I have asked Newport Film if they have footage, but haven’t heard back yet. Braun and Cohen were talking about the film with Cohen playing the role of interviewer. It almost felt like they teasing me having Mr. Ackman just sit there quietly. The questions went on for a bit, and you could almost feel that this is probably the longest Ackman has gone without a microphone in his hand. At one point, he awkwardly grabbed the microphone to answer one of the questions. I’m not sure he gave it up the rest of the night. Ackman talked about everything from meeting the Hispanic victims to general MLM behavior. My wife and I clapped particularly loud when he said that these companies sue their critics and try to get them fired from their jobs. One of the other interesting things that Ackman mentioned is that it was only the second time he’s seen the film, with the first being at the Tribeca film festival. After the panel, Bill had a few words with the NewportFilm people. I hovered while he finished up with them. Then he turned to me and held out his hand. I thanked him for what he’s doing and explained that I’ve been writing about MLMs for 8 years, have had 3 lawsuits, and probably 7 or 8 cease and desist letters. I explained that I would love to be in his position to declare an MLM a pyramid scheme like he’s done with Herbalife. Herbalife isn’t dumb enough to sue a billionaire Bill Ackman. No MLM company is dumb enough for that. However, burdening “Lazy Man” with an expensive lawsuit is another story. I realized my website could be the perfect honey pot to trap MLM companies. An MLM company could sue me thinking that they are picking on “Lazy Man” and find themselves having to deal with a bunch of consumer advocates such as Bill Keep, Truth in Advertising, and maybe even Bill Ackman’s or John Fichthorn dollars looking to set further precedent to protect consumers against MLM scams. What an awesome experience. I am glad you got to watch the movie and meet Bill Ackman. I look forward to seeing it too.